Help your students prepare for the SAT®* and ACT® tests with these FREE Test Prep Tip Sheets. By seeing examples of SAT and ACT question types and the strategies for answering them, your student will be better prepared for each test. 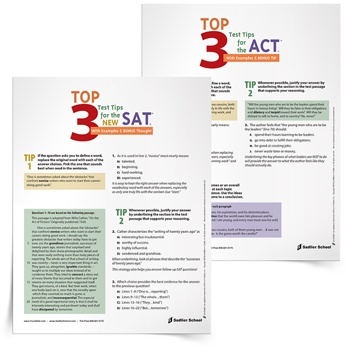 Fill out the form to download the Top 3 Test Tips for the NEW SAT and Top 3 Test Tips for the NEW ACTTip Sheets now. *SAT is a registered trademark of the College Board, which was not involved in the production of, and does not endorse, this product. ACT is a registered trademark of the ACT.